David Sims, a photographer after my own heart! Working as a fashion stylist, I’ve quickly come to realize the importance of working with a team that shares the same vision. A potluck of ideas when shooting an editorial or commercial photo shoot can be detrimental to the finished product, leaving an entire team of professionals (makeup artist, photographer, wardrobe stylists and hair stylist) with a lackluster creation. Although all parties involved play an important role in the photo shoot’s aftermath, the photographer’s ability to capture the subject(s) in front of the lens is truly what molds the entire project. 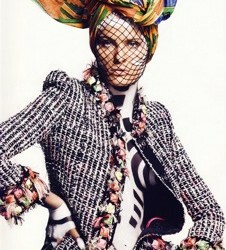 David Sims, a British photographer worthy of all photography praise! His career humbly began as an assistant to accomplished photographers Robert Erdmann and Norman Watson. After acquiring the necessary knowledge, Sims pursed his calling by joining MAP, a London, New York and Sydney based agency representing some of the world’s leading talents in creative fields. His dexterity has landed him work with fashion’s topnotch publications; Harper’s Bazaar (USA), W magazine and a list of clients ranging from Prada to Givenchy. His work continues to be admired by all and I can only dream of one day working with him. Yes, David Sims… A man after my own heart!